Tapas at Quimet Quimet in Barcelona for the Toro Bravo Cookbook, fall 2013 McSweeney's. There's a lot going on right now so I'm sorry to do two of these types of posts in a row but such is life. 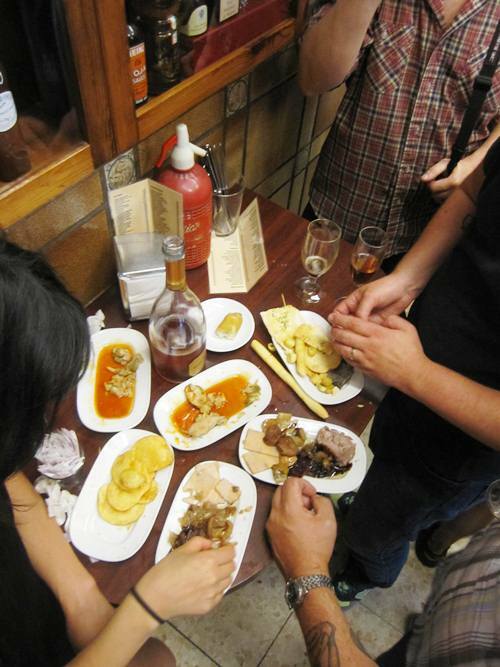 We had an incredible eat/drink trip to Spain last week for the Toro Bravo Cookbook and hit Madrid and Barcelona hard. Three hours of sleep a night hard. We only had a little less than a week in Spain total so we felt like sleep should be the last thing on our agenda. While there we ate old cuisine such as roast suckling pig and Cocido Madrileno, new cuisine at Ferran and Albert Adria's restaurant Tickets, drank all sorts of tasty cava, cider, wine and spirits and we had some true blue adventures some of which I'll describe in detail in future posts and some of which I never will. When in Spain. I plan to do a series of posts with photos from Spain in upcoming weeks. I hope that you're doing well!